Audio For Drinking: "When you love someone, but the thrill is gone"
"When you love someone, but the thrill is gone"
One of the most amazing debut albums I've heard and like yesterday's music, an album I considered at length to call my favorite of the year. 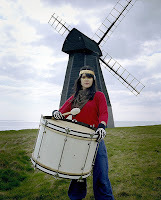 Others tended to agree as Fur & Gold by Brighton, England's Bat for Lashes was even nominated for a Mercury Prize. Bat for Lashes is essentially a moniker for songwriter Natasha Khan, a former nursery school teacher who studied music and visual arts, citing influences such as Steve Reich and Susan Hiller and who thankfully eventually went the music route. A lot has been made of her resurrecting England's "druid rock" with her tales of wizards and horses and others have dubbed her the Brits first notable entry to the US-dominated, so-called freak folk movement. The fantasy world entwined in some songs and Khan's obvious interest in mysticism has also solicited worthy comparisons to Bjork and Kate Bush (especially the formers ability to conjure up a beautiful otherworldliness). "What's A Girl to Do" was actually my favorite music video this year, though the song itself may be the most conventional on the album. While simply shot, I was just entranced by the costume-headed bike riders doing bunny hops. Her voice and the piano is enough to pull me in, but there's so much interesting instrumentation throughout the album, from harpsichord to marching cymbals and handclaps contrasted by a mini-orchestra. Khan has already penned a follow-up that could be dude late next year. Bat for Lashes - download "What's A Girl to Do"